When the flow rate becomes unacceptably low, the filter can be cleaned by removing accumulated dirt from the top few centimetres of sand. Various methods are possible, but all disturb the biological layer, which results in less effective filtration for some time. Some methods however are less disruptive than others. The recommended cleaning method is called ‘wet harrowing’. This is done by filling the filter with a bucket of water, after blocking the spout (for instance using a cork). Following removal of the diffuser plate, water is slowly swirled around by hand inside the filter. Try not to touch the sand while doing so. The movement of the water loosens accumulated dirt, which comes into suspension. This muddy water can then be carefully decanted, using a cup. The process is repeated until most dirt has been removed. Remove the cork and the flow rate should have increased dramatically. The advantage of wet harrowing is that it does not disturb the biologically active slime layer that has grown within the sand and around the individual sand grains. Therefore the cleaning action of the filter is only slightly affected compared to for instance removing sand, washing it and returing it into the filter. In conclusion: wet harrowing works very well. This technique is effective, needs less work and disturbs the biological layer less (Lukacs, 2002 [ref.01]Ref.01: Lukacs, H.A. (2002). From Design to Implementation: Innovative Slow Sand Filtration for Use in Developing Countries. MSc Thesis. Massachusetts Institute of Technology, USA. ), allowing water to be drunk after a shorter time than where other techniques are used. Do households understand how to carry out maintenance? Adequate training during installation and sufficient follow-up is perhaps a weak link in any biosand filter project, as householders tend to forget or ignore advice given regarding maintenance, contributing to sub-standard performance of filters. An evaluation of a filter project in Kenya found that some filter owners clean their filter out of routine, rather than because of blockage or inconveniently reduced flow rate. This poor practise, because such filters unnecessarily produce water of less than perfect quality, since their bio-layer is disturbed more often than necessary. If this is the case, better teaching of correct maintenance could therefore be an effective and simple method to improve the quality of water produced by a large percentage of filters. Sometimes reducing flow rates are a seasonal problem. For instance, during the rainy season water can be much more turbid. It seems that during this time, blockages can occur in the filters every few weeks. 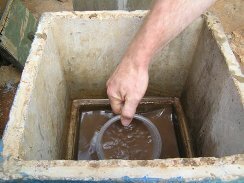 An evaluation of a demand-led BSF project by Tearfund in Afghanistan showed that 51% of the respondents were using and could correctly describe the wet “swirl and dump” method of cleaning the BSF, 17% indicated that they are using the “sand removal” method, and 13% either could not describe the cleaning method or described it incorrectly. A problem of incorrect depth of water above the top surface of the sand layer was noted in 47% of the BSF surveyed. It was noted that issues identified with installation, operation and maintenance are likely to impact the filtered water quality, and may be contributing factor for the 22.2% of filtered water samples which were measured to have greater than 10 cfu/100ml (Burt, 2012; [ref.02]Ref.02: Burt, M. (2012) Evaluation of a demand led biosand filter programme in the complex emergency context of Afghanistan. Tearfund, Teddington, UK.). It is important to remember that a ‘dirty’ filter actually can produce water of better quality. Due to a reduced flow rate better filtration takes place, while there is an increased contact time with a mature biological layer. Cleaning should therefore only take place when the outflow of water has become inconveniently slow. While a bio-sand filter ideally produces 1 litre per minute, filling a 20-litre jerry can in 2 hours can still be very convenient to an African family, even though this equals a flow rate of only 0.16 litres per minute. In some projects it is found that a majority of households will either forget or ignore cleaning advice. In such cases, bio-sand filters cannot be considered a 100% failsafe method of water purification despite their potential, but rather as a ‘better-than-nothing’ interim method of water treatment. This highlights the need for intensive teaching methods. It is likely that better information, teaching of cleaning methods, or improved or more frequent follow-up will lead to much better results. Ref 01: Lukacs, H.A. (2002). From Design to Implementation: Innovative Slow Sand Filtration for Use in Developing Countries. MSc Thesis. Massachusetts Institute of Technology, USA. Ref.02: Burt, M. (2012) Evaluation of a demand led biosand filter programme in the complex emergency context of Afghanistan. Tearfund, Teddington, UK.